It's been a few months, but I thought I'd come up for air as I finish my book about my great grandfather's enigmatic garden, Miraflores, to mention that San Antonio's tricentennial year will commemorate Doctor Don Aureliano Urrutia's life and legacy in many ways. I am so excited that this amazing man and his work will be remembered during our city's very special anniversary. January 2018, John Phillip Santos: The City of San Antonio Department of Arts & Culture presents St. Anthony's Lost and Found, an exhibition opening on January 25, 2018, 6-10 pm. The exhibit will highlight a multi-faceted poetry project headed by San Antonio Poet Laureate Jenny Browne. John Phillip Santos' contribution includes an excerpt on Miraflores from his work "De Unos Lugares Perdidos or, of a Few Places Lost in Time." Culture Commons Gallery, 115 Plaza de las Armas, exhibit runs through April 28, 2018. March 2018, Brackenridge Conservancy Event: The Brackenridge Conservancy will hold its annual "Spirit of Brackenridge Park" gala on the grounds of Miraflores on March 29, 2018. The gala will honor San Antonio's former mayor, Lila Cockrell, and Scotty & Patsy Pittman Light, and I will present a short excerpt from my book. The City is resuming construction toward the goal of restoring several pathways at Miraflores after a short hiatus to re-work the plan after uncovering preexisting walkways buried underground. The Conservancy looks forward to offering guided tours in this now City-owned space as soon as the walkways are in place. May 2018, Aguirre-Urrutia Book Essay : Trinity University Press will publish a book edited by cultural historian Claudia R. Guerra. The volume will focus on the iconic events, people and places that created San Antonio and Bexar County. Among the many articles and photographs included, the book will feature an essay co-written by myself and Nancy A. Aguirre, Assistant Professor of Latin American History at The Citadel, entitled "Exiles of the Mexican Revolution in San Antonio." Aguirre has also contributed two sidebar articles--one on immigration during the Revolution and one about La Prensa newpaper. I have contributed a sidebar article about the provenance of Miraflores. Early 2018, Steve Bennett Book Article: The San Antonio Express-News will present a book, also published by Trinity University Press, featuring many Express-News SA300 history series stories that have run throughout this year. 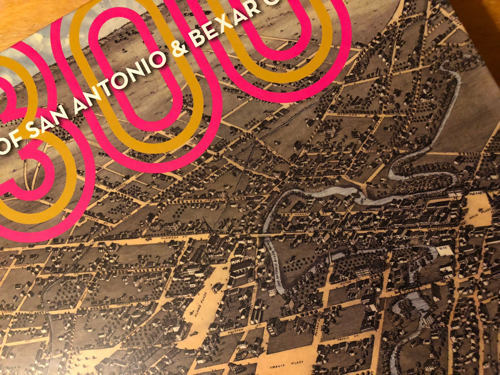 The coffee-table book, entitled "San Antonio Stories: Centuries of Culture and Community," will contain over 500 pages by staff and freelance writers for the paper. An article on Urrutia by Steve Bennett, Arts and Architecture writer, will be featured in the volume. 2018, Book About Urrutia's Miraflores: My book has a working title Jardín mexicano de la memoria ~ Miraflores ~ a Mexican garden of memory and is well under way. The book recreates Doctor Urrutia's beautiful garden as he conceived it. With extensive photographs, maps, and archival and personal research, the garden will come alive as a creation worthy of study and exploration. For more information and updates, subscribe here or sign up for updates at the bottom of the page. There will be more to come on la vida de Dr. Aureliano Urrutia as I continue navigating and writing my way through his intricate and complex history, but I'm very proud to see the life of this exile from the Mexican Revolution becoming more appreciated now in San Antonio.